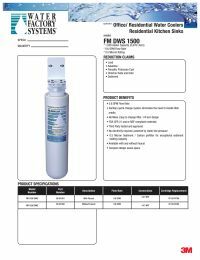 The Water Factory Systems FM DWS 1500 Filter is the genuine replacement cartridge for the FM DWS 1500 system. This high performance filter cartridge effectively reduces CTO (chlorine taste and odor), cyst, lead, and asbestos from your water. Leaving you with fresh tasting water for drinking and cooking. 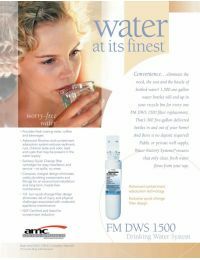 NSF Certified The FaucetMATE FM DWS 1500 Filter is made of NSF/ANSI certified materials. FDA Approved Filter components are manufactured with FDA compliant materials. Contaminant Reducer Reduces sediment and bad chlorine taste and odor from your water.